Awesome news via the Associated Press: Sports Illustrated's new edition (on newsstands tomorrow) features Stephen Colbert in a U.S. Speedskating uniform! As noted in previous posts, The Colbert Report and Colbert Nation recently rescued the national governing body for speedskating, raking in more than $250,000 in donations when another title sponsor pulled out of their arrangement. 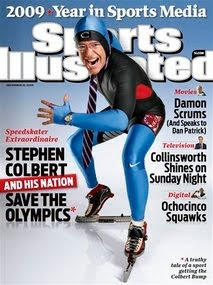 Kudos to Colbert -- that photo cover is awesome, and I can't wait to read the sports media cover story. Bravo, SI, for celebrating Colbert's contributions to Vancouver 2010 and sport. I saw your comment on the Star-Ledger article and wanted to thank you for the coverage of speedskating on your blog. I'm helping with promotions for the speedskating team and we're so grateful to all the bloggers who are helping keep our athletes in the news. I invite you to become a fan on Facebook and follow us on Twitter if you're interested. Looking forward to reading more of your blog during the Olympics!